The G20 summit meeting in Buenos Aires, Argentina ended with an agreement to disagree. They agreed to disagree about maintaining multilateral trade rules and they agreed to disagree about the need to combat global warming by reducing carbon emissions and greenhouse gases. And they agreed to disagree on dealing with the major world problem of migration. The Trump administration claimed that the US was being scammed by China and other countries over trade because multilateral organisations like the World Trade Organisation were allowing America’s trade competitors to take advantage of US technical know-how and subsidising their industries at America’s expense. And the Trump administration was determined to avoid having their energy industries and resources restricted by any caps on fossil fuels and the resulting carbon emissions. So the US will stay out of the Paris climate agreement while the others will stick to it (although only in words not action). The hyped up meeting between Trump and China’s supreme leader Xi Jinping turned out to be a ceasefire. The US agreed not to impose its planned hike in tariffs on Chinese exports for three months, while the Chinese agreed to buy more US agro goods (which it would do anyway). As for controlling China’s supposedly ‘unfair’ exports to the US or reducing its restrictions on US corporate capital in China, everything was put on pause for negotiation. The trade war may well resume in spring 2019. The G20 itself showed that there will be no pause in the increased rivalry between a hegemonic economic power in relative decline (the US) and the rising technological and trading might of China (and other Asian economies). As long as the world economy crawls along at no more than a 3% real GDP pace and world trade growth slows to a trickle, this will be just first chapter in the new 21st century economic battle. The IMF, supposedly providing an objective view on behalf of global capitalism (and not any one nation or group of nations), is clearly worried. IMF general secretary Christine Lagarde expressed her concerns: “I emphasized that global growth remains strong, but that it is moderating and becoming more uneven. Pressures on emerging markets have been rising and trade tensions have begun to have a negative impact, increasing downside risks. Choosing the right policy is therefore critical for individual economies, the global economy, and for people everywhere”. The G20 summit showed that these aims stand little chance of happening. For Trump “modernising rules-based multilateral trade system” means getting rid of the WTO and doing everything by bilateral trade deals where the US is not outnumbered. For the others, it means just that: outvoting the US. So the US tariff increases are not going to be “reversed” – on the contrary, it is very likely that Trump will block any role for the WTO in future trade deals. So the end of ‘globalisation’ and ‘free trade’ is over as Trump’s America looks to reverse its loss of trade share and, even more important, its weakening returns from international capital flows. I said back in July that it was “a threshold day” for the global economy when Trump first imposed his tariffs on China’s exports and the retaliation from China began. And the impact of these measures is already being felt. If energy (oil) exports are excluded, the world trade in goods has ground to a halt. As the OECD-G20 researchers put it: “Excluding large oil exporters, such as Russia and Saudi Arabia, G20 trade was flat, suggesting that the steady expansion seen over the last two years may have stalled as recent protectionist measures begin to bite.” In the United States, exports contracted by 1.7%. Although exports grew in China (by 2.4%) – partly reflecting the exceptional sale of an oil platform to Brazil, which helped push up Brazilian imports by 18.0% – this only partially offset the significant contraction of Chinese exports (down 4.9%) in the previous quarter. Exports also contracted in the European Union as a whole (minus 0.8%), for the second straight quarter, and in Australia (minus 2.0%), Japan (minus 2.0%), South Africa(minus 0.8%), Turkey (minus 0.6%) and India (minus 0.3%). The WTO announced after the G20 meeting that world trade growth would slow even further. China’s export growth has slowed and economic activity as measured by the so-called purchasing managers index (PMI) has paused (ie the PMI in November was 50). 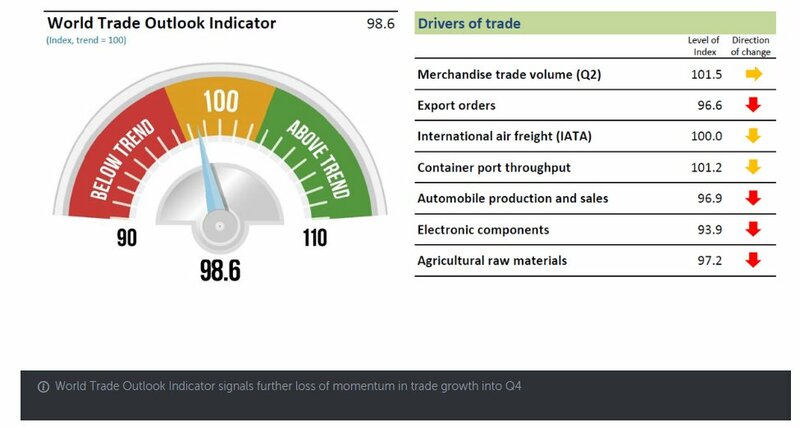 Everywhere the PMIs are dropping and Germany, a key industrial trading nation and the main European exporter to China, suffered a fall in real GDP in Q3 2018. Indeed, real GDP growth over Q3 2017 plunged to just 1%. In contrast, the US economy expanded by 0.6% in Q3 and year-on-year growth in real GDP was 3%, but Q3 growth slowed from Q2 and Q4 is most likely to show a further slowing. So with global real GDP growth set to slow going into 2019 and world trade no longer expanding at all, the rivalry between competing capitalist economies, and between the US and China will intensify. And trade is not the only worry for the world capitalist economy. Only last month, the IMF exclaimed its concerns about the risks of ‘excessive debt’, particularly in the corporate sector globally. And then just before the G20 meeting, US Fed Chairman Jay Powell in his speech to the Economic Club of New York, seemed to suggest that he might not hike the Fed policy interest rate as much as he and the market expected in 2019. What’s he worried about, given that US real GDP growth is sliding along at 3% a year (latest Q3 2018 data) and corporate profits are up 20% after tax (thanks to Trump’s corporate tax cuts)? The answer appears to be in the Fed’s new Financial Stability Report. The report cites four indicators to monitor for a financial crash and concludes that the current risk is only “moderate”. But the Fed report noted that that “debt owed by businesses is historically high, and risky debt issuance has picked up recently.” and “credit standards for some business loans appear to have deteriorated further”, while “leverage of some firms is near its highest level seen over the past two decades.” Along with “Brexit and euro-area fiscal challenges pose risks for U.S. markets and institutions” and “problems in China and other emerging market economies could spill over to the United States.” It seems that the risk of a new recession is not ‘negligible’ but indeed ‘moderate’. 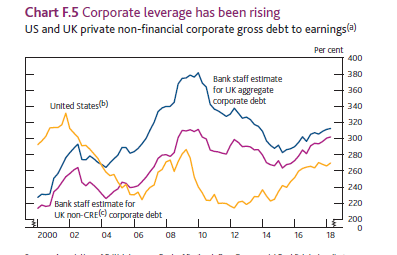 The risk of a corporate debt bust was also echoed in Financial Stability Reports of the Bank of England and the European Central Bank, also released this week. The ECB put it this way: “A large stock of legacy debt continues to weigh on the euro area non-financial corporate sector. On aggregate, the indebtedness of euro area NFCs remains high by both historical and international standards. The falling trend observed since early 2016 appears to have come to an end, with the consolidated NFC debt-to-GDP ratio stabilising at 82% for the euro area aggregate – a level that is still above thresholds associated with a debt overhang”. But things are ok because 1) “debt-to-total assets and debt-to-equity ratios for euro area NFCs point to more favourable developments though, having approached or even fallen below the levels observed at the start of EMU given higher share prices and the related positive denominator effect”; while 2) debt servicing costs remain very low. In other words, as long as interest rates do not rise too much, stock markets stay high and corporate profits continue to rise, then there will be no crisis. But “A sudden deterioration in economic growth prospects or a cost shock could, however, undermine corporate profitability, while rising trade protectionism may hamper the profit-generating capacity of export-oriented firms.” Exactly. 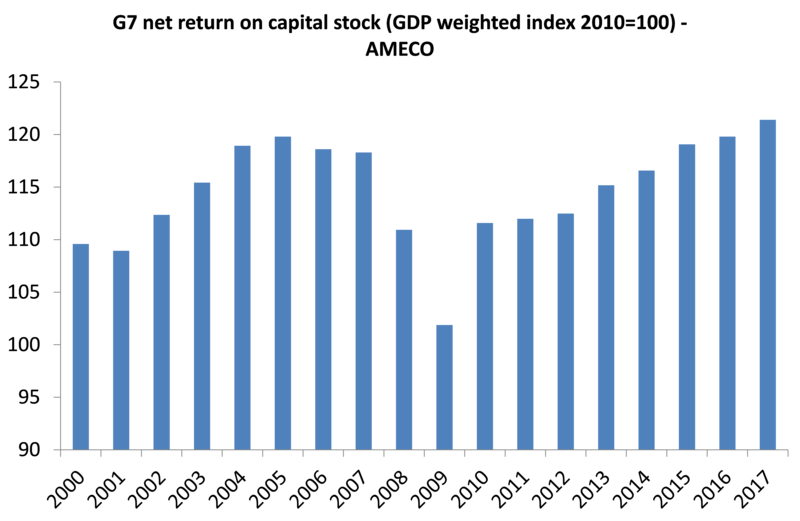 The huge rise in corporate debt in the so-called emerging economies is well documented. And in many previous posts, I have shown that this debt creates conditions for a sharp downturn in investment and growth in emerging economies when the dollar strengthens or the Fed hikes its interest rate (Turkey, Argentina). 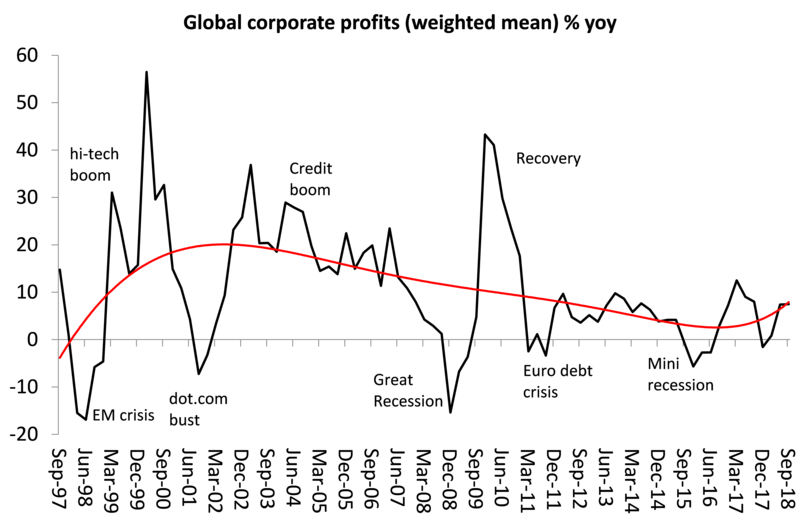 The underlying basis for economic growth in capitalist economies is the profitability of capital. Using the EU AMECO database, we can measure the net return on capital stock (NRC) for many economies. The G7 weighted average NRC peaked in 2005, well before the Great Recession. The G7 rate of profit only got back to the 2007 level ten years later in 2017 – and only because of improved profitability in the US and Japan. The other five economies still have lower rates of profit. Indeed, it has been a long depression in global profits growth since the Great Recession. Between 1997-2007, global profits growth averaged 15% yoy. Since 2008, it has averaged only 6.3% and from 2011, only 4% a year. After the Great Recession in 2008-9, global profits recovered sharply before falling back in the Euro debt crisis of 2011-2. Another modest recovery took place until oil prices and energy profits collapsed in 2015. Then energy prices recovered along with energy investment. As long as global profits continue to rise, a new slump in global investment and production will not emerge. But in the last few months, oil prices have slumped again and with trade in the doldrums, the prospects for profit growth in 2019 are dimming fast. This entry was posted on December 2, 2018 at 8:37 am and is filed under capitalism, economics, Profitability. You can follow any responses to this entry through the RSS 2.0 feed. You can leave a response, or trackback from your own site. What do you know about real global wages and their relation to real global profits? Are they rising, stagnant or falling?